Indoors or outdoors, in containers, in the ground, in full light or shade, in formal or casual settings, herbs can be beautiful, aromatic and delicious. 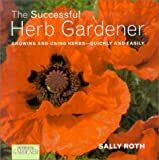 Inveterate gardener Roth (Reader's Digest Complete Yard and Garden Problem Solver) dispenses advice on herb growing from start to finish, including: determining which climates, amounts of light, soil conditions and drainage are compatible with which herbs; prepping the soil and planting; using tools; controlling weeds and pests (both organically and conventionally); harvesting and storing. With 300 magazine-quality color photos and illustrations, several recipes and instructions for making wreaths and other decorations, this book will appeal to the Martha Stewart crowd. Far better than using store-bought herbs is to grow and use your own-and here's everything you need to know to do just that.